Providing Quality Appliance Repair in Pleasant Hill, Concord, Danville, Walnut Creek, and West San Francisco. 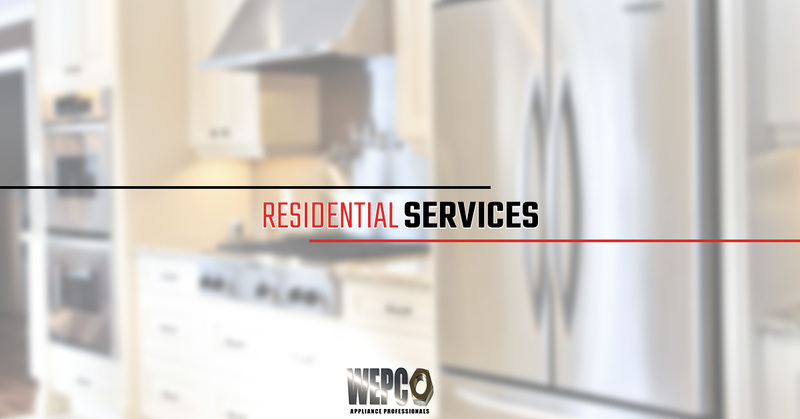 At WEPCO Services, Inc. our appliance professionals are thoroughly trained and qualified to repair all major residential appliances. Our repair technicians have decades of experience repairing all major brands of home appliances. Before you look at replacing your appliance, let us diagnose the problem and offer an obligation-free quote on repair; it could save you hundreds to thousands of dollars. Washer– The most common wash machine problems are that it won’t spin, it makes loud noises or shakes, it won’t agitate, won’t drain, fills slowly or not at all, or it leaks. Whether your machine is front or top loading, or dual washer/dryer combo, we can diagnose and repair it. Dryer– Common dryer issues are that the machine will not turn on, it has become excessively noisy, clothes come out wrinkled, it does not tumble, there is no heat, multiple cycles are required to dry clothes, or it is too hot. We can troubleshoot and repair any of these issues in all major brand dryers, gas or electric. Ovens, Ranges, Stoves, Cooktops, Microwaves– Generally, complaints about cooking appliances are that there is no heat, uneven cooking, inconsistent temperatures, doors won’t seal, lights stop working, or gas stoves won’t light. Our expert appliance technicians can repair all major brands of electric or gas cooking appliances. Dishwashers– Common dishwasher issues include it is not draining, will not fill with water, leaking water, is noisy, will not start, the door won’t latch, dishes aren’t clean, won’t dry dishes, or will not dispense detergent. If your dishwasher is experiencing any of these symptoms, let us troubleshoot and repair it. Trash Compactors– Common symptoms of a malfunctioning trash compactor include the door won’t open or close, it is excessively noisy or smelly, won’t stop running, motor runs but ram doesn’t move, ram is stuck in one position, or it will not run at all. We can troubleshoot the problem and repair it quickly. Refrigerators– Common complaints about refrigerator performance is that they will not maintain a constant temperature, they are too warm or too cool, it is making odd noises, or the ice machine stopped working. Our appliance professionals are EPA certified for refrigeration repair and qualified to handle any job, including sealed system refrigeration. WEPCO Services, Inc’s appliance professionals can also repair your small appliances such as ice makers and garbage disposals. If you don’t see your appliance or brand listed here, give us a call, it is likely we can diagnose and repair it. We are a certified, preferred service for Dacor products! Why should you trust WEPCO Service, Inc. with your home appliances? We do not subcontract; if you hire us, you will work directly with a licensed and insured WEPCO Service, Inc appliance professional. We offer a 1-year buy-back warranty on all parts and a 90-day labor warranty for all services. We are proud to boast an A+ Better Business Bureau rating for years because we offer honest, quality service to every customer as if they are our only customer! We are Dacor Prefered Service Providers!